Soil surveys, classification and mapping for agricultural development, farm optimisation or land capability assessments. Climate analysis to determine suitability of the present climate for crop production. We also conduct estimates of the impact of projected future climate scenarios on crop suitability. Our analyses can include climate comparisons with known areas. Determination of crop water requirements, water balance calculations and scheduling of water supply. Advanced spatial analysis procedures on supplied or generated digital elevation models te derive a collection of descriptive topographic parameters. We believe an updated map is the basis of good farm planning and management. We compile highly accurate maps, from GPS surveys and GIS technology or from scale correct high resolution aerial photography as a low cost alternative. Our block/orchard designs reflect the best practical layout that combines the natural resource properties and efficient use of farm machinery and labour. We also assist in the planning of farm infrastucture such as roads, sheds, water points, etc. We closely collaborate with dam engineers and irrigation designers and draft the relevant specifications. We have developed a systematic procedure to quantify the fine scale terroirs (natural environment - soil, climate, topography) of a farm, that forms the basis of detail farm design. The subdivision of agricultural land in South Africa is regulated by Act 70 of 1970. We conduct the required studies and compile the prescribed applications for subdivision. Rezoning of agricultural land is also regulated by Act 70, whilst an EIA is required in most cases. We assist developers and town planners by compiling the prescribed agricultural impact assessment as part of the EIA process. Windfarms are mostly situated on agricultural land. We conduct the required studies as input to the EIA process. applications for mining on agricultural land. 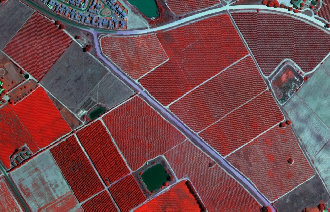 We make use of the LREye airborne multispectral camera system to capture Red, Green, Blue and Near-Infrared imagery of our specified target area at a predetermined time window. Resolutions can be specified. Turn-around time is less than 7 days. Most crops/plants have very specific climate requirements. Our national and global database on various climate elements enable us to conduct spatial climate suitability assessments and depict the results as a series of maps. While the evidence of climate change is becoming more visible by the season, the potential impact on crop production is less clear. By using the regional predictions derived from complex General Circulation Models under various future scenarios, we are able to map the possible impact on crop performance. 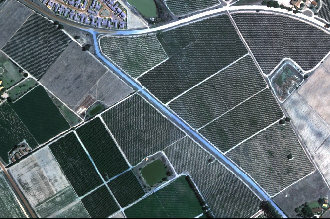 Depending on the locality and date of capture, we choose between GeoEye, WorldView or RapidEye platforms to acquire archived or tasked imagery for our clients. Our holistic approuch, broad experience, superior technical skills and good knowledge of agriculture in Southern AFrica makes us the ideal team partner for the development of environmental plans or management frameworks for areas that include agricultural land. In conjunction with GEOSS (Geohydrologists) and Nick Helme Botanical Surveys, we have compiled the Biodiversity Best Practice Guidelines for Potato Production in the Sandveld of South Africa.